Flowers at Mokeehia, Maui, Hawaii (USA). April 04, 2005. 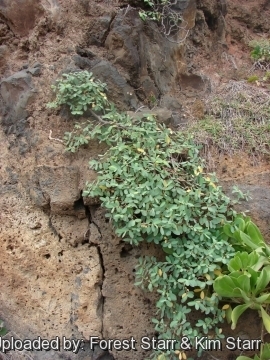 Origin and Habitat: Niʻihau, Kauaʻi, Oʻahu, Molokaʻi, Lānaʻi, Maui, Kahoʻolawe, Hawaiʻi islands, Hawaii, USA. 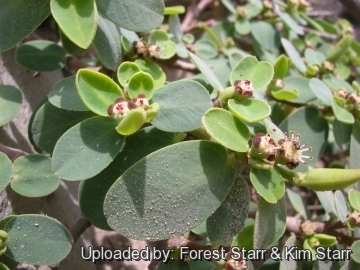 Habit: Euphorbia celastroides var. amplectens is a fairy common drought-deciduous variety found in upland arid rocky slopes on all the main islands. The variety amplectens, a common plant, apparently hybridzes with Euphorbia celastroides var. kaenana, an endangered species in the inland portion of var. 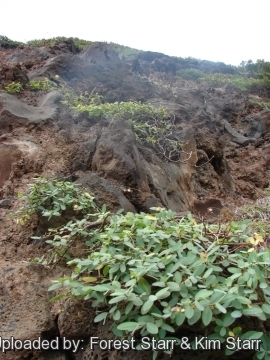 kaenana range in part of Punapōhaku Gulch on the north side of Kahanahaiki Valley in the Mākua Military Reservation. This appears to be a hybrid swarm. 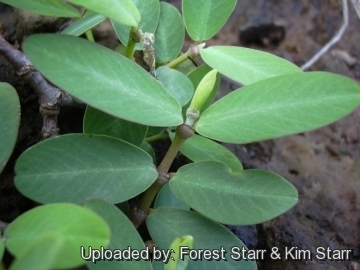 Description: Euphorbia celastroides var. 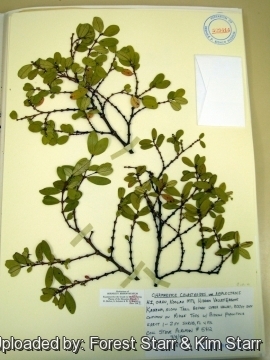 amplectens, previously also known as Chamaesyce celastroides var. amplectens is one of the several varieties of Euphorbia celastroides distinguished by its pubescent leaves. The variety amplectens is a variable medium-sized evergreen shrub and can have a spread of 3 metres or more. This species develops into a sprawling shrub. The flowers are not attractive. The red or pinkish fruits, however, enhance the beautiful foliage. Stems: Forms a loosely branching short trunk. The secondary or young branches are stiff, with short internodes. Leaves: Distichous (growing in two vertical rows), pubescent (with hairs), grey/silverish to light green that may have a glaucous coating. Often the leaves in the summer assume a red-violet colouring. 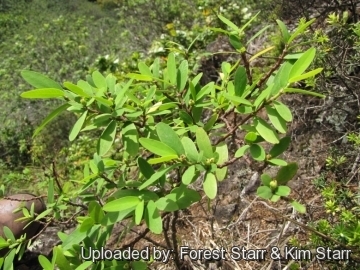 It does not lose its leaves in the winter, due to the warm climate of its range, but is drought-deciduous. Damaged or old leaves turn a blood red as they die. 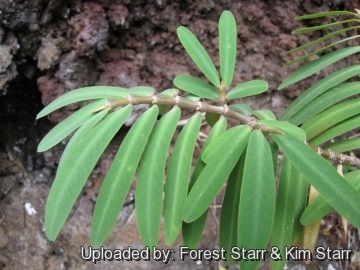 1) Forest & Kim Starr “Euphorbia celastroides var. amplectens (Akoko)”. Plants of Hawaii. 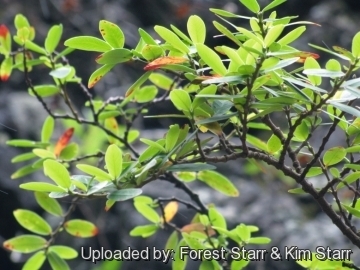 <http://www.starrenvironmental.com>. Web. 27 Sep. 2014. 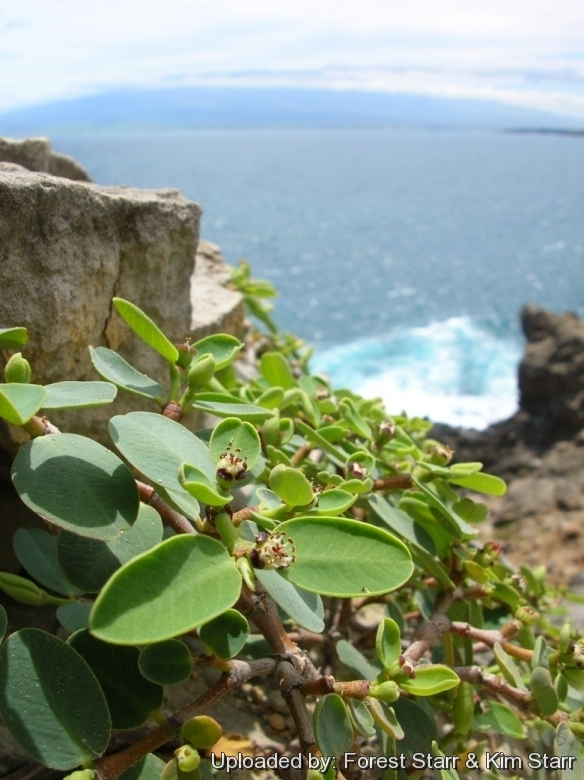 11) Robert Pearcy & John Troughton "Photosynthesis in Tree Form Euphorbia Species from Hawaiian Rainforest Sites" Plant Physiol. Jun 1975; 55(6): 1054–1056. 14) 10) U.S. Fish & Wildlife Service “Chamaesyce celastroides var. kaenana” 5-Year Review Summary and Evaluation, page 5. Cultivation and Propagation: Euphorbia celastroides var. amplectens or akoko is an attractive tropical species that requires temperatures of 15 °C and full sun to light shade. This plant develops in a fashion similar to a shrub and is tolerant of heat and drought.